The riverfront neighborhood of Water Street and Gouveneur's Slip was among the seediest in New York City in the 1870s and '80s. Brothels, saloons and gambling dens lured sailors and miscreants. Stabbings, shootings, and beatings were common. So Charity Commissioner Thomas S. Brennan's proposal of an "emergency hospital"--a branch of Bellevue Hospital--at Gouveneur's Slip made sense. The free-standing, three-story brick building was completed in October 1885 at a cost of $14,000. 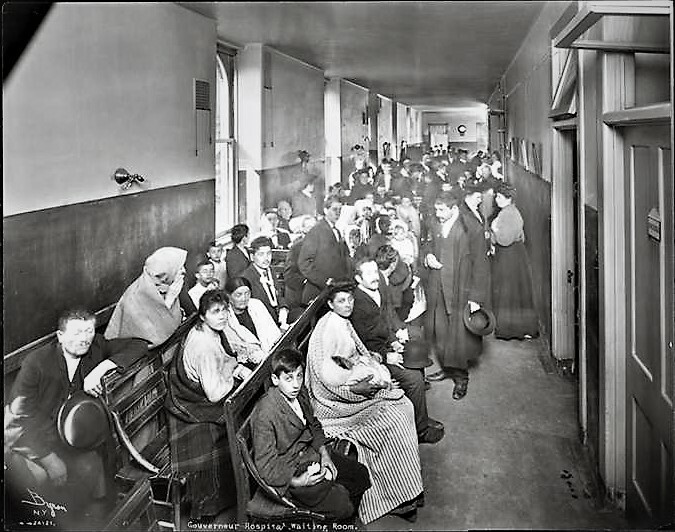 Because, as the New-York Tribune pointed out it was "simply a reception hospital" intended only for emergency treatment before patients were transferred to Bellevue, there were just 30 beds. On October 3, 1885, about two weeks before the hospital opened, The New York Times reminded readers of the character of the neighborhood. "The site occupied was formerly a police station, then a market place, and afterward a resort for thieves and low characters. Its regeneration into a hospital grieves the river border gang, but is hailed as a great improvement by respectable neighbors." Before long the hospital took on the name of the nearby slip. And a decade after its opening, it was clear that Gouveneur Hospital could not adequately meet the needs of the gritty neighborhood. A full-service institution was needed. In April 1897 The Sinking Fund Commission took bids for constructing a new hospital. The lowest bid, of $116,000 from the Mapes-Reeve Construction Company, was rejected because of "a technical error." The next lowest bit was from Mahoney Bros. at $129,400. The total cost, including furnishings and equipment, would eventually rise to $200,000; around $5.75 million today. The cornerstone was laid in 1898, some months after construction began. Designed by John R. Thomas, the building was completed late in October 1900; but a public spat between Charities Commissioner John W. Keller and Public Buildings Commissioner Henry S. Kearny delayed opening until January 5, 1901. In reporting the opening, The New York Times took a jab at the men, saying "Mr. Keller and Public Buildings Commissioner Kearny have been at odds for some months." Four stories of red brick trimmed in terra cotta, the new facility could accommodate 104 patients. The Times deemed it "the most perfectly equipped in the Charities Department." The intention was always that two wings would stretch back from the main administration building; but only the north wing was included in the first stage of construction. Running alongside the old hospital, the end of the wing was rounded, thereby doing away with interior corners where dirt and germs could accumulate. The Times reported "The doctors' and nurses' quarters and the dining rooms are all that could be desired. The laboratory and operating room are filled with up-to-date apparatus, including an X-ray machine, the only one in the Charities Department." The case of one of the hospital's first patients, 24-year old John Bellinette, reflected not only the type of injuries the facility would receive, but the character of the neighborhood. Bellinette lived at No. 44 Oliver Street; but he was found just before midnight on Saturday, January 12, 1901 in the yard of No. 22 Hamilton Street. He had been thrown from the fourth floor window. Two neighbors informed Patrolman Edward J. O'Rourke that they had seen the crime from their rooms. "While they were still at the window they saw a man stoop over the body of the injured man and take his overcoat and hat," reported The Times. O'Rourke went to the apartment and arrested Salvatore Adriate, his wife, Theresa, and another woman, Philamina Perchaine. Bellinette's overcoat and hat were on the bed. The three "denied that there was any quarrel in their rooms, and said they did not know who the injured man was." An investigation, however, revealed that Raphael Cresanzo and Francisco Rimardo had also been in the room at the time of the "accident." Bellinette, it was revealed, was accused by Cresanzo of cheating him out of money. Fearing for his life, Bellinette tried to escape onto the fire escape and was pushed to the ground. Two days later he was still in critical condition in Gouverneur Hospital with a fractured skull. By spring 1903 the City was ready to erect the southern wing. 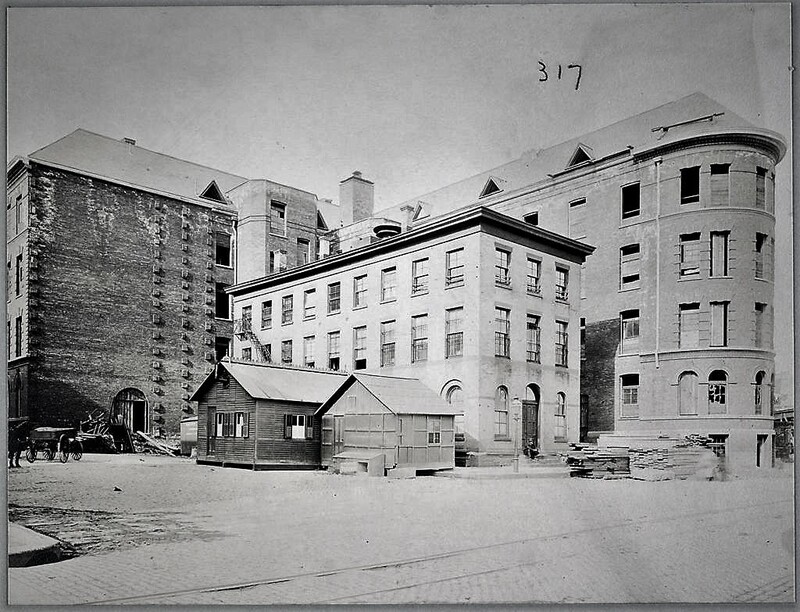 The Real Estate Record & Builders' Guide reported on April 18 "Probabilities point to the speedy completion of Gouverneur Hospital...The new administration building with one wing was opened in 1901, and now it is desired that the other wing be built." Architect Raymond Almirall was give the commission; but he closely followed Thomas's design, resulting in a visually-balanced structure. It was not until July 1909, however, that the City contracted for what would become perhaps the hospital's iconic feature. Bids were taken for "railings, supports and all other work for inclosing the balconies and balcony stairways." The wonderful iron, rounded balconies were outfitted with curtains for privacy and protection from direct midday heat. The treatment for some diseases, notably tuberculosis, included fresh and and sunshine. Beds and wheelchairs could be rolled out onto the balconies to provide both. 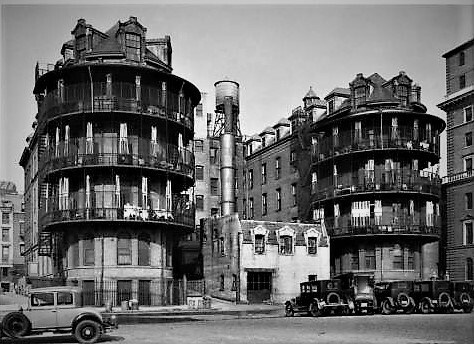 By now the Lower East Side was filled with filthy tenements crammed with indigent immigrant families. At the turn of the century there were 330,000 residents per square mile, tasking the staff at Gouveneur Hospital with another type of patient--children. Infants and toddlers in poor families suffered from malnutrition, measles, whooping-cough, heat prostration and pneumonia. 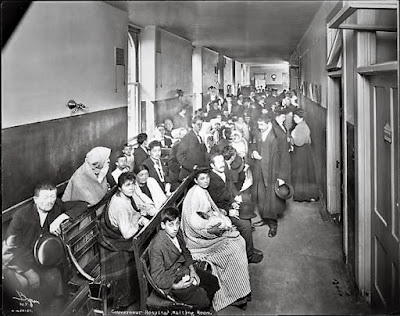 Infectious diseases spread within the hospital, since there was no "detention room." Three times during the winter of 1913 the children's ward had to be quarantined. In 1917 the Department of Health recommended "that a salary sufficient to retain a nurse specifically trained in the care of children be provided." The investigating committee deemed $600 a year appropriate. In the meantime rampant crime and gang activity continued. A peculiar case was that of Mrs. Branaslaw Kucharsky, a 41-year old washwoman. Around 9:00 on the morning of July 14, 1919 two strangers were seen entering the tenement building where she lived at No. 113 Stanton Street. About an hour later a neighbor entered her flat and found her on the floor. An ambulance from Gouveneur Hospital arrived, but found her already dead. The New-York Tribune reported that she "was either murdered or died of fright when attacked during the robbery of her home." Gangster violence repeatedly resulted in injuries, often fatal. On the night of June 13, 1920 Angelo De Rocco waited in ambush outside a Rivington Street movie theater. When Rosario Demario exited, the "bushwacker," as described by the Tribune, opened fire. Demario was struck in the back and the panicked crowd scattered. Two policemen nearby chased De Rocco, who fired his revolver at them as he fled. Detective Anthony J. Fater returned fire, hitting the fugitive once in the back, and then in the leg. Both men were taken to Gouveneur Hospital. But the night was not over yet. Half an hour later Salvatore Campo was found unconscious in his room on the second floor of No. 217 Bowery with five knife wounds in his body and scalp. The Tribune reported "One of the wounds had nearly severed his right ear." He, too, was taken to Gouveneur Hospital. Police later discovered that all three lived in the building--De Rocco on the first floor, Campo on the second, and Demario on the third. Neighbors said that there had been "a long standing quarrel among the boarders." On the night of March 1, 1921, Patrolman Shoemaker was passing No. 46 Pitt Street, just after 11:00, when a man holding a "smoking pistol" staggered backwards out of the doorway and collided with a lamppost. Rocco Franko was holding his bloodied right hand to his chest. Shoemaker called an ambulance for the 27-year old, then entered the building. On the first landing he found Charles Vito, who also held a pistol. The New-York Tribune reported that he "had his right eye shot away. Again an ambulance was called from Gouverneur Hospital." Both men were arrested in the hospital, but refused to give any information. The eye-catching balconies survive--grabbing the attention of drivers on the FDR Drive feet away. Street violence and gangster activity continued to result in emergency cases. In spring 1922 17-year old Samuel Licht had only recently been released from the State Reformatory. On March 26 he stopped a young woman outside a store on Madison Street. Whatever he said to the girl, she apparently took offense. She walked away and Licht loitered around in front of the store. The Tribune reported "Children who were playing in the street nearby saw a taxicab draw up to the curb and stop. Two men got out, stood side by side while they leveled revolvers, and fired simultaneously." One of the bullets lodged in the door of the store, but the other struck Licht in the back of the head. "The two men re-entered the taxicab and were driven off." A patrolman who heard the shots called an ambulance from Gouveneur Hospital, but Liche died on the way. During the Great Depression the Works Progress Administration provided work to artists who, among other projects, decorated civic buildings with murals. 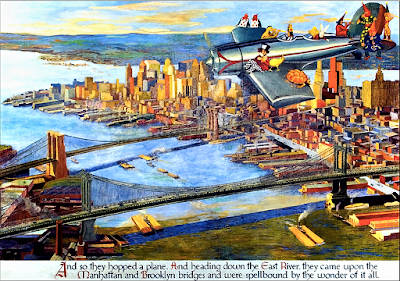 In 1936 artist Abram Champanier began a ambitious series of 15 "Alice in New York Wonderland" murals for the children's ward of Gouveneur Hospital. The oil-on-canvas works colorfully depicted a very modern Alice in settings like the Central Park Zoo, at the Coney Island Playground, at the New York Public Library and flying over the East River bridges. Gouveneur Hospital could boast a few firsts. Dr. Emily Dunning Barringer graduated from the Cornell Medical School in 1897 and was accepted on the Gouveneur Hospital Staff. The Cornell Alumni News later pointed out she was the first female doctor in a New York City hospital, "thereby establishing the precedent of admitting women physicians to general hospital service." Even more shocking at the time, Dr. Barringer was the first female ambulance driver in the world. And in 1940 Dr. George A. Baehr organized a prepaid medical plan for tenants of the nearby housing projects, the Vladeck Houses. Residents paid 25 cents per person per month. The plan evolved into what we know today as HIP. By mid-century the old facility was decidedly out-of-date. The hospital lost its accreditation in 1957, and on November 21, 1960 locals held a nighttime protest around the building. The Times reported "About fifty residents of the area used flashlights to accent their demand for 'a ray of hope' for getting a new hospital to serve the section. Placards complained about service and facilities in the 200-bed hospital." The building was abandoned in 1961 and in June 1963 Mayor Robert F. Wagner announced plans for a new $14 million Gouveneur Hospital. The new facility was opened at No. 227 Madison Street on September 21, 1972. In the meantime the old building sat empty and neglected. Broken windows allowed weather into the wards, including those where Champanier's wonderful 7-foot tall murals once brightened the mood of sick children. In 1980 the City offered the property for sale, and demolition was threatened. Hearing of the W.P.A. murals, Andrew Scott Dolkart and Eddie Friedman of the Landmarks Preservation Commission alerted art conservator Allan Farancz in hopes of saving the artworks. According to Dolkart later, "we were unable to interest any city, state or Federal agency in either paying for their removal and restoration or agreeing to hang the murals once they were removed. "On the night before the bulldozers were to destroy the children's ward, with its murals, Mr. Farancz heroically went in and removed the artwork at his own expense." 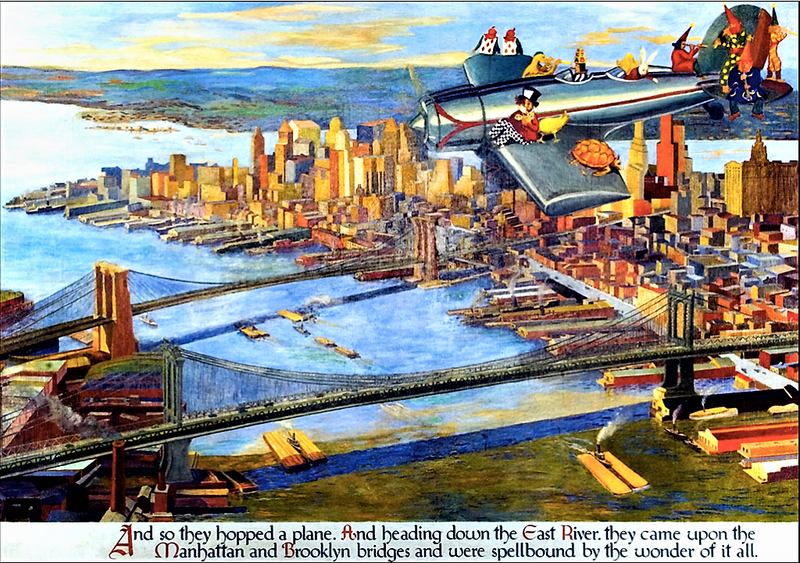 "Alice Flies Over the East River" now hangs in the Cumberland Diagnostic & Treatment Center in Brooklyn. Farancz stored the murals, which one-by-one were eventually conserved. One of them, appropriately, was installed in the new Gouveneur Hospital. In 1992 a nonprofit group, Community Access, Inc., began renovations of what was now essentially a gutted shell. Under direction of architect Peter L. Woll the venerable building was renovated for housing for the elderly, mentally ill and AIDS sufferers. The a splash of Romanesque Revival blends with the overall Renaissance Revival style in the striking terra cotta entrance. Known today as Gouveneur Court, the building provides assisted living housing for low income and special needs residents.